Inspired by the weapons of the popular game Naruto: Ultimate Ninja, these reproductions of the kunai from that series are more than the usual "for display only" fantasy knives. Kunai, a variety of shuriken (throwing weapon) used by the Ninja of old Japan, are simple edged weapons derived from a common farming tool. Similar to the European garden trowel or dibble, the kunai had many shapes and purposes and all of them had points. 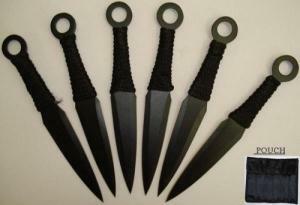 Ninja often made military use of everyday tools and found the variable kunai quite handy. The blackened steel and one piece construction of these 6 1/2" knives is crude, with ringed hilts that provide some balance and slim handles wrapped with black cord. The rather thin rings of the knife butts are not likely to hold up well in use unless you're a practiced thrower who gets it right every time. As all throwing knives are apt to get beaten up quickly, with broken points and bent blades a common result of practice, that lower quality and resulting economy makes good sense. The nylon belt pouch in the set is functional also, but not in any way beautiful. If you buy these knives to display you'll no doubt stash the pouch in a drawer out of sight. If you want to learn the art of throwing, get a good book or a good teacher and don't muscle it. Ricochets are common.